Today is a special day!! Whiff of Joy illustrator and my very good friend Elisabeth Bell is celebrating her birthday today. So I am calling out for all of you who enjoy and love her illustrations as much as I do - head over to Elisabeth's blog and wish her all the best for the future! We had a blast at my son's Niklas birthday yesterday! What an exhausting, but fantastic day. 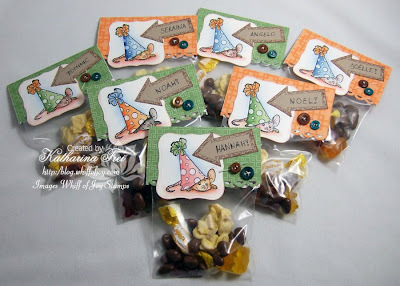 I will share some pictures with you tomorrow, but today I wanted to show you the little candy bags I made for Niklas' friends. Wir hatten gestern einen fantastischen Tag an Niklas' Geburtstag. Es war total anstrengend, aber die Kinder haben jede Sekunde genossen. Niklas is so viel herumgesprungen, dass er heute einen richtigen Muskelkater hatte...haha Ich werde euch morgen ein paar Photos zeigen, aber heute gibt es die kleinen Nach-Sackerln zu sehen, die ich für seine Freunde gemacht habe. I used Whiff of Joy's mouse under a partyhat for my bagtoppers. It is super easy and quick to colour and a fun image. The arrow is a stamp from a Prima Marketing Journaling set. I stamped it on Su kraft cardstock with chocolate chip ink and cut it out. Ich habe Whiff of Joy's Maus unter einem Partyhut für die Bagtopper verwendet. Der Stempel ist super leicht zu colorieren und ausserdem total lustig :) Der Pfeil ist von einem Prima Marketing Journaling clear Stempel set, das ich auf der Messe in Stuttgart gekauft habe. Ich habe ihn auf Stampin' Up kraft cardstock mit chocolate chip ink gestempelt und ausgeschnitten. 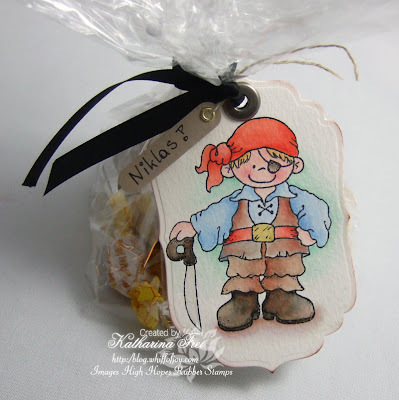 I did a slightly larger bag for Niklas and used the fabulous High Hopes pirate as tag. I punched the sign with his name on with the Su word window punch and set the eyelets with my Crop a Dile. What a fabulous tool, absolutely worth it's money! Für Niklas habe ich eine etwas größere Naschtüte gemacht und den tollen High Hopes Piraten als Tag verwendet. Das Schildchen mit seinem Namen drauf habe ich mit Stampin' Ups Word Window Stanzer gemacht und die Eyelets mit meiner Crop a Dile gesetzt. Was für ein tolles Gerät, absolut sein Geld wert! 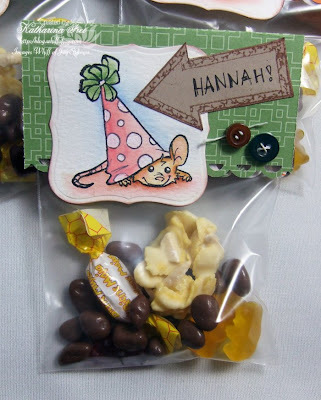 what a great idea - so much nicer than using shop-bought goodie bags for parties. My daughter Willow will be having a party for her 5th birthday in October and I'll definitely be trying this out. Eine spitzen Idee! Da haben sich die kleinen Racker sicher drüber gefreut! Omigoodness, thank you so much Katharina! You are the Sweetest and the Bestest!!! And to everyone else who remembered my birthday, thank you sooo much! You all have made my day unbelievably wonderful!! They must have gone down a storm! Ich liebe es wenn du deinen massen produktion zeigst. Immer so tolle ideën und immer schön verarbeitet. danke für die inspiration die du verbreitest. 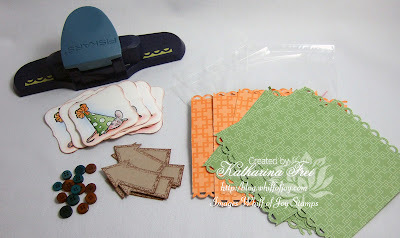 Hi Katharina These are just beautiful and what a great idea. What fun goodie bags! I bet everyone loved them. That image is perfect for parties. I love the Pirate as well. I actually need to use this stamp for a card I need on saturday...pirate themed party, of course! Oh, your coloring is always amazing! klasse Naschtueten absolut tolle Idee!! Da waren die kleinen Gaeste sicher begeistert! They look fabulous,so much more personal to give a beautiful handmade gift!!! Oh my heavens, these are so adorable! Those bags are so cute, what a lot of work, I hope it will be treasured. What a super cool sweet bags! The mouse under the partyhat is perfect for this! I once used your girl with cookies to do the same, with "pepernoten" which are mini cookies in the bag. Hope you had a great day at your sons birthday and a late congratulations. I loved these lovely goodie bags!! !